WoodWorksbyTim, The finest handmade woodworking products for the finest people. Congratulations! You have reached WoodWorksbyTim, LLC. The finest handmade woodworking products for the finest people. 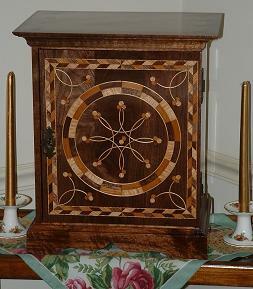 WoodWorksbyTim produces many types of hand crafted woodworking products. If you don't see what you want, please drop me a line, or email me at sales@woodworksbytim.com. Nothing sold here is mass produced. Each item is crafted one at a time in my own shop, with the utmost care and attention to detail. Many products will be available for immediate purchase; others will be listed as "made to order". If an item is listed as "out of stock" or "Sold", I can craft another like it just for you. Just ask! Please keep in mind that every item is handmade, no two can be exactly alike. Each piece of wood is also different, with its own unique characteristics and beauty. This simply means that any item you purchase from me will be unlike any other. I also custom make gift and household items to your specifications. Use the Contact Us link to send me your request. If you have detailed drawings or plans you can send them along with your request to sales@woodworksbytim.com. Oftentimes, one has trouble coming up with an idea for an appropriate gift, or for an accessory for that special location in one's home. Try searching the web for "woodworking plans", you will be rewarded with a multitude of ideas. If you find something you like, send me the link to the plan. I'll review the plan then let you know if I'm willing to craft it, and how much it will cost. You'll be notified of any upcoming sales or specials. You also be able to sign up to be notified when new products are listed, or when a previously out of stock item is available again. Thank you, and enjoy browsing my site.